She’s a fan of the beach, she goes on adventures on the weekend and she’s stable, she’s Unico. 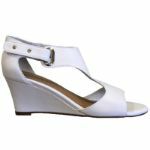 This streamlined White Unico heeled sandal features one of a kind leather work with a synthetic heel for comfort, the wedged heel makes sure this is a stable shoe. 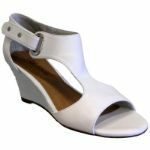 Whether you wear her on the weekend or with your favourite work wear, this stunning shoe deserves to go home with you.